From the point of view of materials this painting is simple. This requires more effort to achieve an acceptable result and this means working the brushes to create a interesting surface in the absence of colours. Apart from the limited palette (Burnt Sienna, Yellow Ochre and Cerulean Blue) there were only three brushes used. This is significant for me as I generally use a range of brushes for each stage in the painting process. I have my favourites. The small long bristled nylon for details, usually at the final stages. The large flats for the expansive areas of sky and the very large ‘filberts’ to blend and soften the clouds. The work horses are the medium rounds for the main areas of painting. These are the most useful as they are wide enough to apply large amounts paint quickly but also for painting areas needing a clean sharp edge. This is achieved by rotating the brush clockwise in left to right strokes and anticlockwise for right to left strokes. In both cases the sharp edge will be on the upper edge of a horizontal stroke. If you try it you will know what I mean.This might sound a little fussy but if your paintings need areas of colour with edges and not outlines, this is a good skill to master. Unusually, as I said above, there were only three brushes used in this very limited palette of ‘dull’ colours. 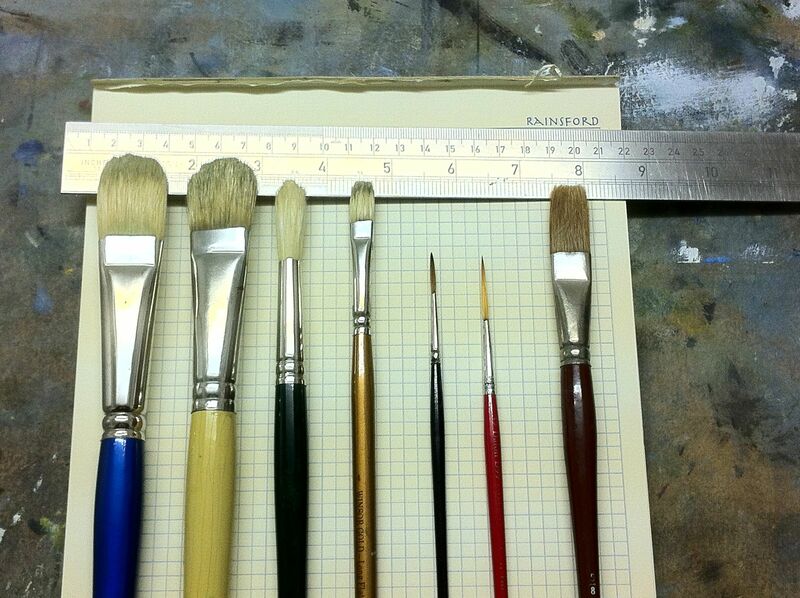 The main reason for using many brushes is to reduce the time required to clean them while painting. This method of applying washes of colour with White Spirits only, effectively kept the brushes clean between the applications of different colours. Another advantage of the ‘no medium, solvent only’ method. The extra effort in the painting I began to talk about, before I digressed into brushes, is the drawing of a multitude of fine lines onto the wet backgrounds. Its not a simple task. There are no ‘construction’ lines or sketch marks to follow. As in all drawing the line makes a definite statement and the image leaves the area of realism (as in photo realism) and becomes representational. This painting subject is from the imagination and the multitude of lines suggest areas of solid mass drawn from the imagination. I am creating what I know is there and not what I would see if this scene existed and I was looking at it. If I allow this to progress I can loose the link to realism and enter the area of ‘fantasy’ images. These images will resonate with viewers whose visual experiences is similar to mine but lack the universal language of the visual world. An ongoing struggle for me as I attempt to keep a ‘look of reality’ in my paintings. Here is the video of the above painting process. The season of autumn is upon us. In the woods the change is most obvious. 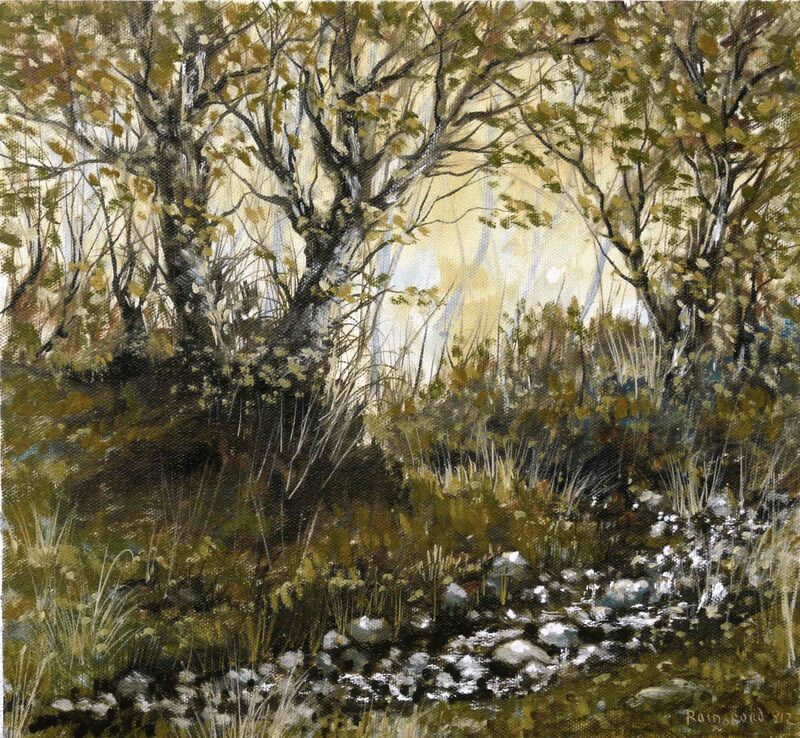 The bright sparkling light filtered through the amber leaves was the inspiration for this painting. Although in shade, there are few deep shadows. I’m trying my ‘watercolour’ method on this woodland scene. As in the previous paintings (here and here) there is no medium used, only White Spirits. I’ve described the method in recent posts. Here, the materials are simpler than before. Three colours and three brushes. Burnt Sienna, Yellow Ochre and Cerulean Blue are the colours used. I will post the video of the painting process in the next few days. This technique is very much a mix of different paint applications, not the traditional oil painting method. Over the years I’ve painted in watercolours and pastels. This time for a change from my normal method I used some watercolour and pastel handling methods. Of course its not exactly the same, and not something I would do on a longterm basis. There are thin liquid washes of White Spirits with fine details painted over the ‘dry’ washes as in watercolour. Because of the medium in the oil paint, the washes are not fully dry as in watercolour, nevertheless, the effect is similar. Also used is an application of paint similar to pastel. The colour is applied flat using the texture of the canvas to remove the paint from the brush. Sap Green is applied in this manner on the trees. Pastel colours are not mixed, each colour and shade are a separate paint stick, which is drawn directly on the textured paper. So it was with this green. Again, because the under-colour was still not fully dry there was a certain amount of mixing. Sap Green is one of the few green colours that can be used in this way. Its very transparent, for this reason its dark in tone in the thick layers and lighter when the layer is thin. So when the wide brush containing pure Sap Green is dragged over the surface of the painting a range of green tones are produced. Add to this the mixing with the wet under-painting and an infinite variety of colours are produced. The ‘painting’ of the moon was actually paint removed with a fine brush moistened with spirits. The circular shape was pressed onto the canvas using a strip of waste canvas rolled into a cylinder. I roll the piece into a cylinder until the diameter is what I need. A compass would seem to be the best way of doing this but the solid piece of canvas can be felt and the diameter seen as a solid circle. Its difficult to draw a perfect circle so this is my quick way of getting a circle at the correct size. Here is the video of the painting process. There is more on this painting here. There’s a little chill in the air to remind us that winter is coming. However there will be a period of changeover when, from one day to the next we can get summer or winter conditions. This seasonal transition is reflected in the individual days where daytime and night overlap in twilight. The most unusual sights are to be seen in the landscape at twilight, sometimes almost unbelievable and can be dangerous for the landscape artist. As I’ve said before, natural phenomena are unsettling in paintings. But not so in photographs, which as we all know, nowadays, can be as ‘creative’ as paintings. Very strange!!! A limited palette as usual was used. Burnt Sienna, Yellow Ochre, Prussian Blue, plus Sap Green. As with the last painting I did not add any medium to the paint, just White Spirits to apply the paint in washes. I have been using this technique quite a bit lately. It allows great control of detailing, plus there are ‘accidental’ flows of paint, like with watercolours, can add interesting shapes. The picture size is about 16″ x 22″. This is bigger than my usual size. The ‘solvent only’ technique is faster than the normal method. Nevertheless, I use larger brushes with larger paintings. This means I’m scaling up my working relationship between brush and area to be covered. This relationship is central to the working method. A bigger canvas with the same size brushes would need an adjustment in the working method. I’m working on the video which is a few minutes longer than usual. A bigger painting takes more time to complete. See you soon. This is a technique you might like to try. It involves using a solvent only, like White Spirits, to flood the surface of the painting in washes, allowing the spirits to evaporate between applications. There is absolutely no medium added. However, remember there is a certain amount of medium already in the paint, but in spite of this the painting will dry to a very flat, matt finish. It will, most certainly, need to be ‘oiled out’ when dry (see here). It reminds me of ‘loose’ watercolour painting, in that the flow of the liquid very often determines the shapes and textures of the final painting. I use this technique to counteract the ‘heaviness’ that can creep into my paintings if I concentrate too much on technicalities. Here, its haphazard and accidental, but I let it flow (literally) and then add the final touches, normally the highlights. This is in fact the reverse of traditional watercolour, where the lightest washes are applied first and the final touches are the darker colours. There are a few things to be aware of. The vapour from the solvent is toxic and flammable. Need I say more! The solvent will flow everywhere, so the canvas will have to be horizontal, or flat on a table top. A soft ‘watercolour’ type brush will be useful to carry the liquid as is the case in watercolour painting. Included on right is a photo of the brushes used. The large ‘filbert’ on the left is used to blend the colours and soften edges but not to apply paint. The second is a standard round bristle, used to apply the final layers of paint. 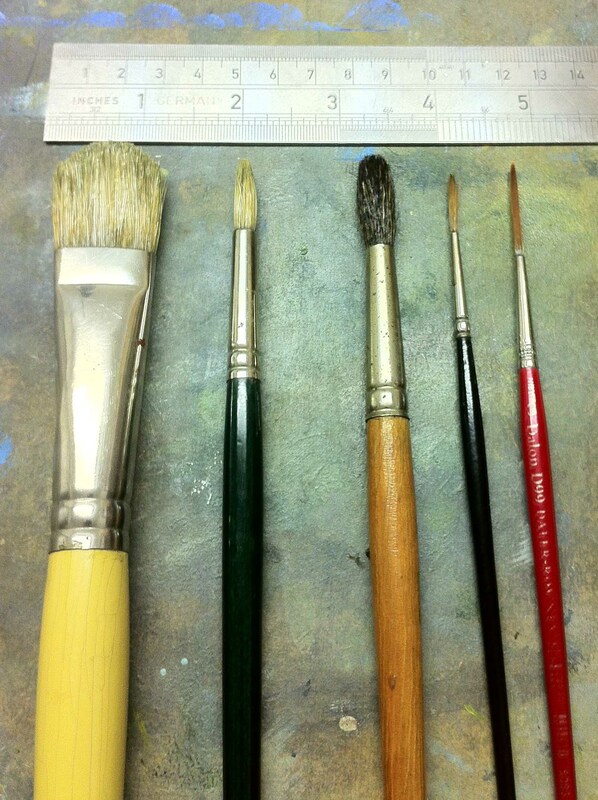 The third is the ‘watercolour’ type brush and the two on the right are nylon fine tipped for details. There are many advantages in this type of painting technique. 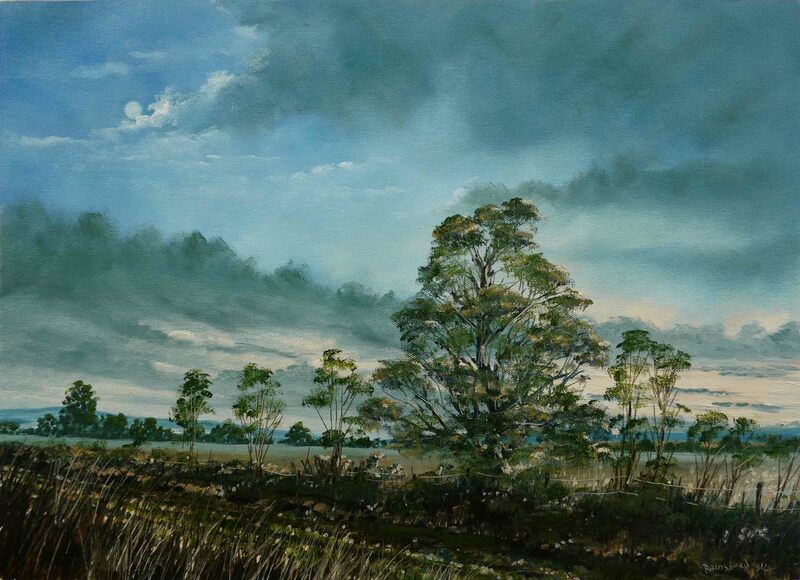 The later layers of colour sit nicely on the under colour, for example the painting of the trees on the sky was easy with no contamination of the dark colours in the fine branches. 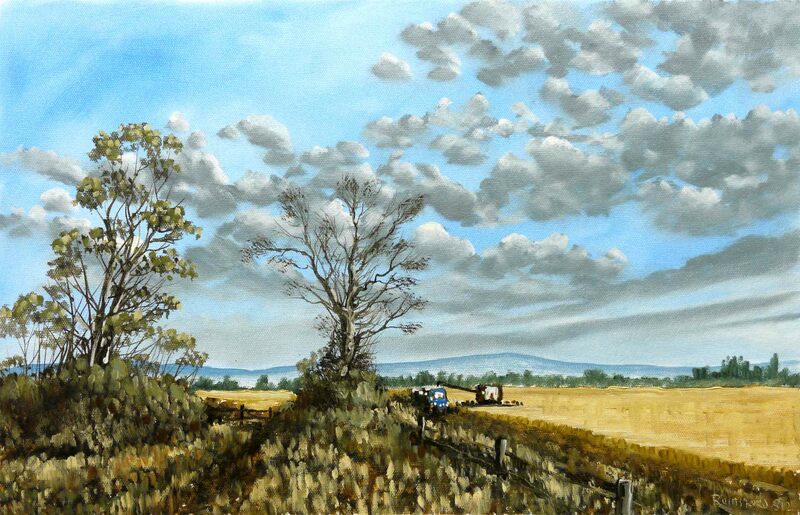 When medium is used in the sky mixes I will usually have to scrape a track with the knife to accommodate the fine lines of trees as in this painting. The paint manufacturers (Windsor & Newton) say this is the only ‘safe’ way to use oil colours. Very thin layers with the minimum of medium. The problems of cracking, flaking, extreme long drying times, etc are reduced or eliminated. But as I said previously, the painting must be ‘oiled out’. There might be a problem with colours which are not fully permanent. Extremely thin layers of a ‘fugitive’ colour could make the fading more noticeable than a thicker layer. I am probably overly concerned with permanence as is reflected in the ‘dull’ colours of my limited palette. Here is the video of the painting process. The size, about 13″ x 20″. The actual painting time was about an hour and a half, with another hour spent waiting for the spirits to evaporate between applications of paint and going outside to ‘take the air’. There is a panic in our farming community because of the continuous wet weather and the difficulties it causes. When the sun does shine, its intensely hot and the crop dries, but the ground is waterlogged making it impossible to operate heavy machinery. Hopefully we get a few more days like the one in this painting. This is a limited palette painting again, Burnt Sienna, Raw Sienna and Cerulean Blue. What’s unusual with this painting is the application of paint. There was no medium used and the colours were applied as washes with White Spirits. The method is similar to watercolour but with the order of light colour first, reversed, with the shadow colours built up first. The only problem is with ventilation as the Spirits evaporate quickly. I will go into the method in more detail in the next post when I have the video of the process. I may have mentioned it before but this method of painting is very much related to materials and their handling. Come to think of it, most painting techniques are the same. Watercolours look like watercolours, regardless of the subject of the painting. The same is true with pastels, inks etc. Acrylics and Oils can sometimes be mistaken for each other, because the method and materials are similar. The point I’m making is this, the more competent the painter is with their chosen medium, the more potential there is for creating a satisfying painting. You might think this is an obvious conclusion. Not to everyone. Too many beginners decide they are not good enough to be a painter after a single attempt. Practice is good. Practice without pressure to produce the goods, is better. Copying a photograph is not so good. Copying a painting is good, as all the stuff like original concept, inspiration, planning, background and also the subconscious stuff working in the background which the experienced artist isn’t even aware of, are not obstacles to learning how the materials work. I like watching YouTube videos of other artists working (this is a great resource for beginners and experienced artists). Sometimes I cringe at the working methods I see because I work differently. Brushes are a case in point, I take great care of my brushes, many painters don’t. I’m not talking about cleaning them but just using them. A particular brush type does a particular job well. It can do other things but not well. I include a photo of the brushes I used to paint this picture. Notice the ruler to give an indication of size. A painting has ‘flat’ areas like large areas of skies, and lines, some narrow and some wide. Generally, flat brushes for flat areas and round brushes for lines. The entire sky was painted with the brush on the left. A ‘filbert’ with long-ish bristles, partially cleaned between colours. The second from the left was used to blend the colours and soften the sky – not to apply colour. 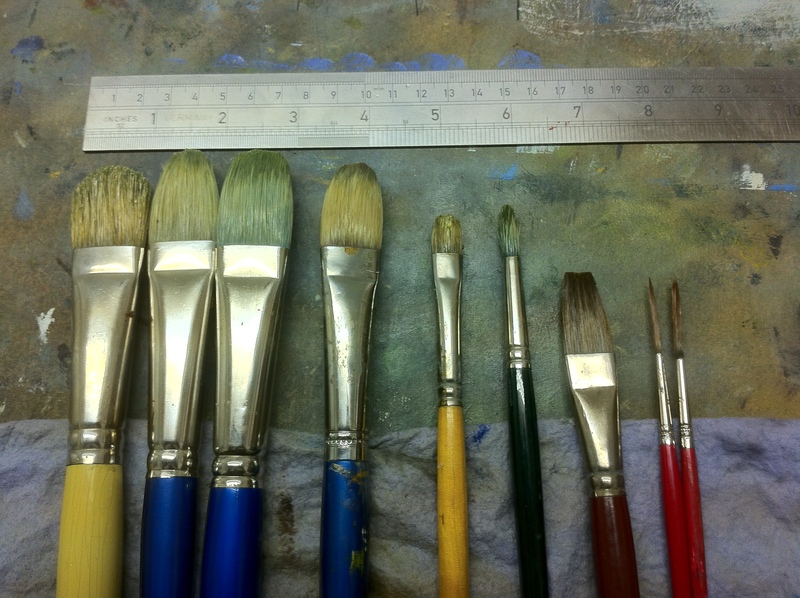 The third from the left is a round, also long-ish bristles and this was used in almost all the rest of the painting. This implies lines make up the bulk of the painting and, to a certain extent, this is true. The only ‘flat’ area was the distant corn fields and the pathway, and here the flat, fourth from the left, was used. The other ‘flat’ areas were the distant blue trees and the water in the left foreground. Here the ‘sky’ brush (first from the left) was used. 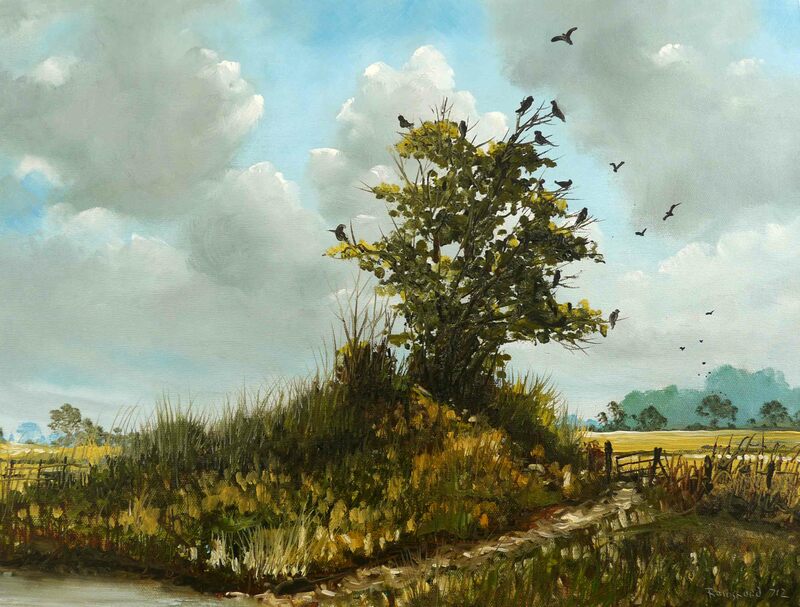 The small round ‘nylon’ brushes draw the really fine details like the tree branches, birds, gate, posts and grasses. The large ‘Ox Hair’ on the right, I use to do the initial sketch with solvent only, like a watercolour technique. The different brushes can be identified in the video by the colour of the handles (not intentional, just luck). So here is the video. The colours and medium was discussed in the last post. P.S. I will not be posting for the next week or so. I will be in Bavaria in Southern Germany. Hoping to get to the Durer Exhibition in Nuremberg.